I want to revisit a question that I’ve posted on before, but for which I haven’t found a satisfying answer: Is ‘any’ charity as good as one charity in cause-related marketing? Here’s the setup: for each item bought from the page in their circular to the left, the Rite Aid Foundation will donate $1 to local causes. The last time I posted on this subject was a campaign from Irwin Union Bank, which would donate $50 in your name to any charity you designated when you opened a certificate of deposit account for $10,000 or more. 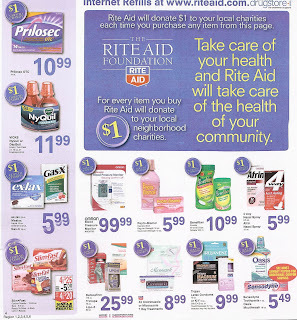 This Rite Aid campaign is different in that the putative donor can’t designate the charity to which the $1 would go. The Rite Aid Foundation bases its donations on funding requests it receives. So money only goes to local charities that make a request of the Rite Aid Foundation. Moreover, to add a wrinkle, Rite Aid already has a longstanding relationship with Children’s Miracle Network (CMN) with which both parties are evidently happy. The argument for partnering with a specific charity is that they have appeal or affinity that ‘any’ charity doesn’t. You can’t put ‘any’ charity’s logo in your materials. ‘Any’ charity can’t help you with promotional needs. ‘Any’ charity doesn’t have staff to call with questions or concerns. Etc. In my posting about Irwin Union Bank I suggested that this was a potential topic of study for academics. But in Rite Aid’s case, given their experience with CMN, they’re in position to say which works best for them. Wouldn’t it be wonderful if they’d share? Is ‘any’ charity as good as one charity in cause-related marketing? i don't think so i think every charity has a wonderful cause despite its marketing. I believe one charity is as good as another.